Do you have a blockbuster app idea which will make you the next social media titan? Or, would you like to develop an app for your business, making it easier for your customers to see your products and/or order your services? We can help! We've created apps large & small, for small companies to large DOW30 corporations, and can help you through every step of the process from design to launch in the Apple App Store or on Google Play. The FoxRT app presented a specific problem and solution: "How can you rip Twitter video content and repost the content on your own feed with your own post/description?" Then, we asked, "How can you take that same ripped video content and crosspost it to your FaceBook page?" It took six months of intense work, but eventually we were able to solve both problems with our unique patent pending algorithm and without employing any servers to make the conversions. The entire process takes place within the user's phone. FoxRT has close to 4,500 iOS installs, and has a 4.29/5 rating on Google Play. WINNER: Tagline Awards, Bronze Medal, 2017. 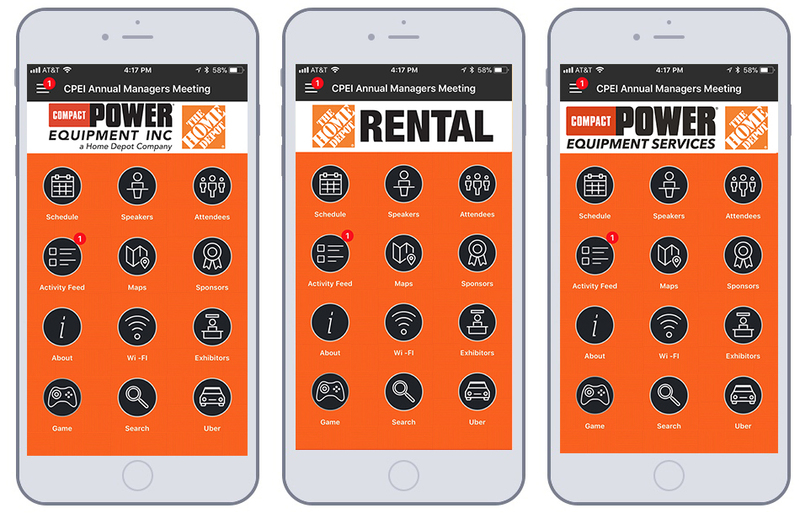 After receiving the Bronze Medal for our FoxRT app, we were honored to be chosen by The Home Depot to create their 2018 Home Depot - Compact Power Equipment Annual Manager's Meeting Event App. The app included the meeting schedule, attendees, speakers, maps, games, exhibitors, and activities. In order to capture the parent company and two divisions represented at the 2018 Home Depot - Compact Power Equipment Annual Manager's Meeting, we created a rotating banner which opened based on the attendee's division and cycled through to all represented. A small detail, but important.